9A-1.00, 1934 U.S. Easter Charity Seal Block, full gum, F, MNH. 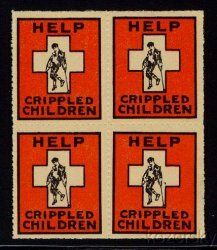 Boy on crutches on Greek Cross; 'Help Crippled Children," black and orange. 9A-1.00, 1934 U.S. Easter Charity Seals Block of four (4) seals, full gum, F, MNH. The first year that National Easter Seals were issued. Boy on crutches on Greek Cross; 'Help Crippled Children," black and orange. Although over 70 yrs old, looks fresh, vibrant colors, full gum, with square corners, no perforation tears, or breaks. Dealer stock, not from a collection. These seals are becoming more difficult to locate in mint, never hinged condition. Easter Charity Seals are usually classified as Charity Seals or Cinderella Stamps.